Supposedly "the wrong color" according to an Onell Design blog post, the red paint on the mostly grey Armorvor Engineer Mimic is not quite what they were shooting for. Rather than destroy it, they sold it, which makes me wonder how many (hopefully none) of their releases were perfectly good but just not perfect. It's kind of scary. If you have some Mordles odds are you don't need to collect them all - but you might. 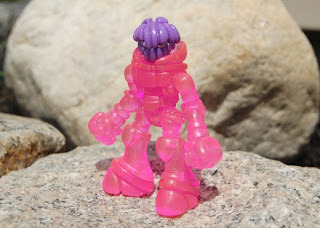 The insanely bright Solar Storm (Hot Pink) Mini-Figures are so bright, there's probably something wrong with them. By selecting a color more in line with a Lisa Frank notebook, team ToyFinity brought out something unexpected and interesting, which is a nice change of pace. The line of Mordles will probably feature repaints for quite some time, so this is a nice place to start rather than going to, say, red or brown. 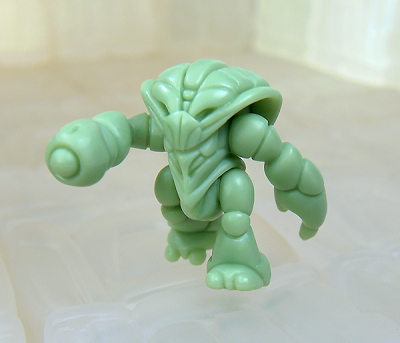 Glyos Lost Sincroid Army Test Shots Exist, Drop Date? 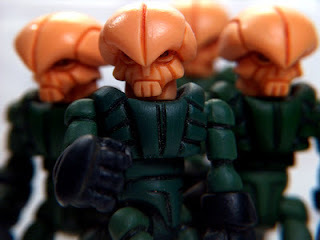 "Production [Lost Sincroid Army figures] are now real (I'm looking at a test shot right now). We're working on multiple surprises for the September release. As of now, we're planning for September 8th. Multiple colors beyond the Ivorinium are on tap." 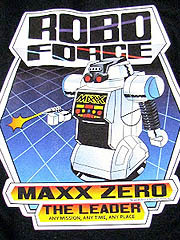 The image above is stolen borrowed from a 2007 Onell Design blog post and may not be at all representative of actual future product. New Glyos Drop Coming - September! Check out the post Crossworlds at Onell Design for more. 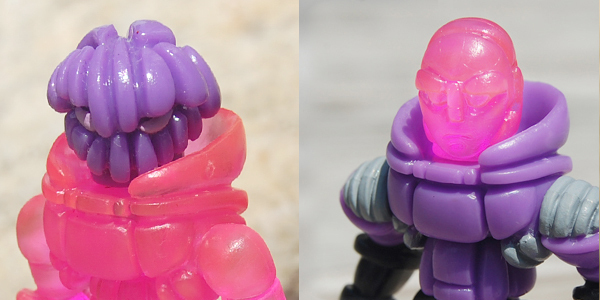 It's worth seeing one of the first shots of a Four Horsemen Power Lords figure with some Glyos pieces plugged in! 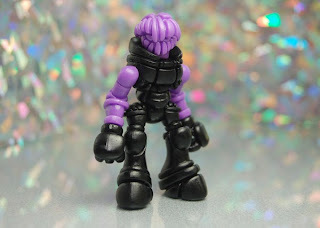 The prototype was supposedly shown along with a number of other upcoming Glyos-compatible figures, plus a trove of archival super-rare figures. It sounds like fun! The Lymerran Crayboth was announced to be coming in stock at the Onell Design store on Wednesday and units are back and available. If you missed this freebie from the last drop, now is your chance to grab one for just $3.00! Believe it or not, the yellow MVR Standard Gobon is the first "standard" Gobon ever, even though flavors of him have been around for several years in silver, blue, gold, black, and numerous other colors. 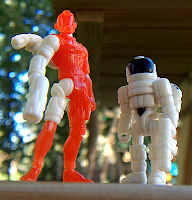 This is based on some of the earlier sketches of the character, and the reverse figure (white with yellow arms and legs) was produced at the same time as part of a six figure (technically seven) release in July of 2013. Standard Gobon was the first to sell through, and it's worth noting that a Gobon is usually around $10 and this one was a bargain basement $8.00. Gold! Another of The Council of Travelers, this gold Traveler Urballim Pheyden reminded me a lot of C-3PO. If you put him next to the Imaginext Jedi Force figure, they're quite similar in stature and could easily swap vehicles. While not painted, this Pheyden does have a rich, swirly gold plastic that looks great. The drop is live now! As with the last drop, Ni Stuff's stuff sold fast - some quasi-custom not-quite-production pieces were sold out before I could get into the store, so I don't even know what they cost. Figures were as low as $10 this time, and I popped for a NV Subject (below) based on the head for Styre as I didn't have one of those yet. You should check some of these out, if you dare. Five new production figures were available, many of which were down to low double-digits or sold out in under 15 minutes. The Pink Powered Theta is the only one which has a healthy number of inventory and it will no doubt be gone before you can get a sneeze out. Seemingly all the customs were gone before I got in, so hey, good on you if you got one of the few production pieces. The Lymerran Crayboth (or that's what I'm calling it) is showing up as a freebie in select orders from Onell Design's Noboto/Gobon drop last week. It's an unpainted, lime green figure and as always, I love it. Other figures in the drop include 3 Nobotos, 2 Gobons, and a Pheyden under new names with new colors. Some of these are still available in the Onell Design Store. New figures on Monday! 481Universe.com will have multiple new production figures and customs at 9 Eastern on August 5, 2013. Numerous preview pictures, teases, and a video are up on the blog. There's no menu or price list yet, but there is a new Styre head - hey, that's worth something Check it out!